In this lesson, we will learn how to deal with the properties of equality and write an equivalent expression to a given one. 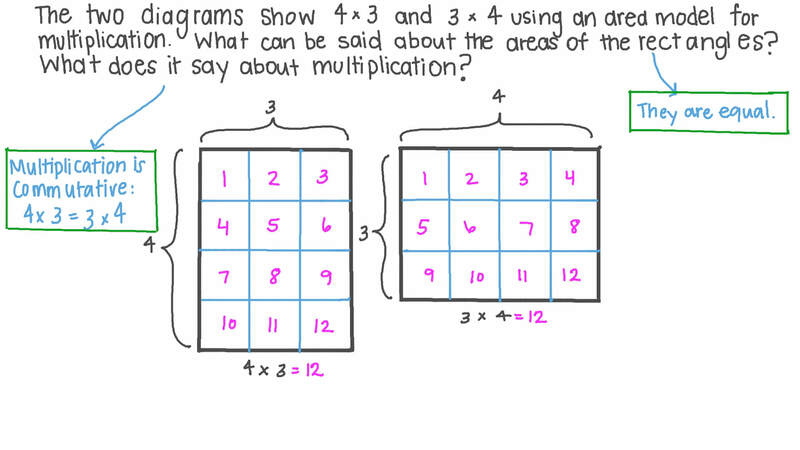 The two diagrams show 4 × 3 and 3 × 4 using an area model for multiplication. What can be said about the areas of the rectangles? What does it say about multiplication? AThe multiplication is associative: 4 × 3 = 3 × 4 . 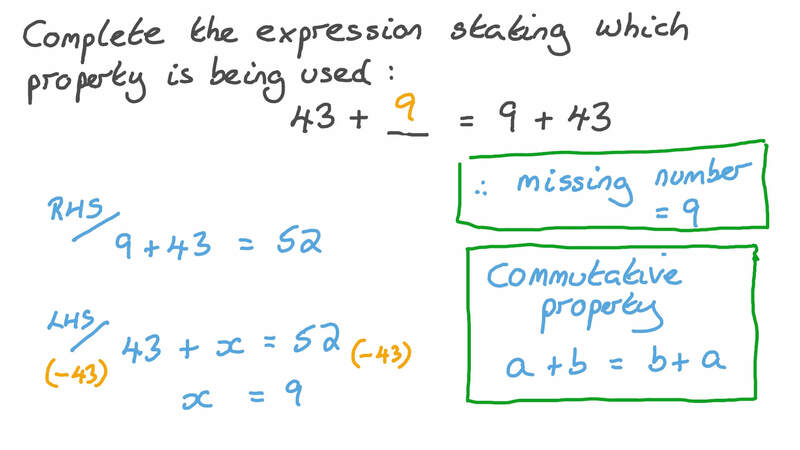 BThe multiplication is commutative: 4 × 3 = 3 × 4 . Complete the equality stating which property is being used: 4 3 + = 9 + 4 3 . What equivalent expression to 𝑎 + 𝑏 − 𝑐 does this diagram show? The diagram shows a rectangular prism (A) that has been divided into three horizontal slices (B) and into four vertical slices (C). The volume of the rectangular prism as represented in (B) is written as 𝑉 = 3 × ( 𝑎 × 4 ) , where 1 × ( 𝑎 × 4 ) is the volume of one slice. Choose an expression for 𝑉 as represented in (C). What property of multiplication does this diagram show? How many slices with a volume of 12 volume units are there in the rectangular prism? Which of the following demonstrates the symmetric property of equality? AIf 𝑥 = 𝑦 and 𝑦 = 𝑧 , then 𝑥 = 𝑧 .
BIf 𝑥 = 𝑦 , then 𝑦 = 𝑥 .
CFor any 𝑥 , 𝑥 = 𝑥 . Which of the following demonstrates the reflexive property of equality? AIf 𝑥 = 𝑦 , then 𝑦 = 𝑥 .
BFor any 𝑥 , 𝑥 = 𝑥 .
CIf 𝑥 = 𝑦 and 𝑦 = 𝑧 , then 𝑥 = 𝑧 .
𝑥 + 3 = 7 𝑦 − 9 . 7 𝑦 − 9 = 𝑧 ( 𝑧 + 1 ) . 𝑦 = 4 𝑤 . Without solving for 𝑥 , 𝑦 , 𝑧 , or 𝑤 , select the true statement. Which of the following demonstrates the transitive property of equality? BIf 𝑥 = 𝑦 and 𝑦 = 𝑧 , then 𝑥 = 𝑧 . 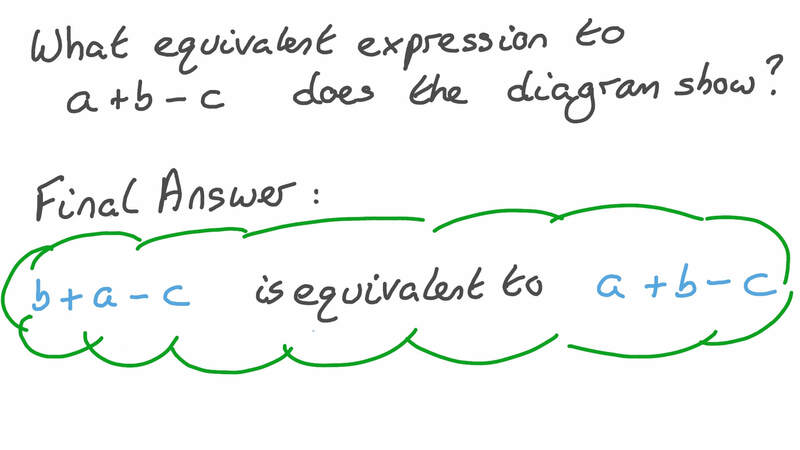 Which of the following figures has an area that can be represented by the expression ? The diagram shows a rectangle of sides 𝑎 + 𝑏 and 𝑐 + 𝑑 . Its area is thus ( 𝑎 + 𝑏 ) × ( 𝑐 + 𝑑 ) , which can also be written as ( 𝑎 + 𝑏 ) ( 𝑐 + 𝑑 ) . Work out the area of the smaller rectangles that make up the bigger rectangle to find an equivalent expression to ( 𝑎 + 𝑏 ) ( 𝑐 + 𝑑 ) . Which of the following expressions is equivalent to 𝑧 + 𝑧 + 5 ? Which of the following expressions is equivalent to 1 2 𝑡 + 1 4 𝑡 + 1 4 𝑡 − 3 ? Which value of 𝑦 will make the following statement true: 𝑦 ( 2 𝑥 + 3 ) + 5 = − 8 𝑥 − 7 ?